Here is a simple and fun project. 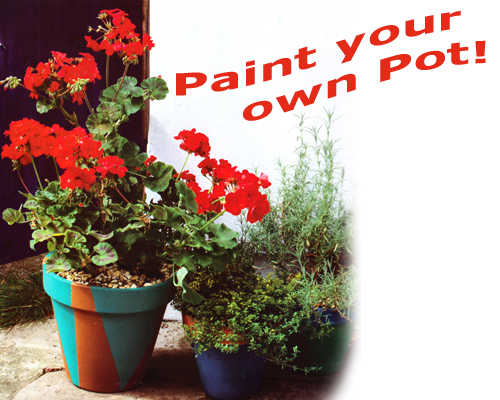 By following these simple steps you can create your own inspirational containers for your home or garden areas. The brilliant colors of the Mediterranean are recreated with these painted terracotta pots. While the plants thrive in the climate of the Mediterranean, they also perform perfectly in less predictable weather conditions. Step 1. 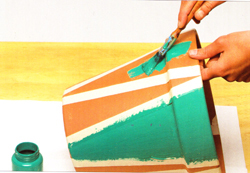 Paint the pots with solid colors or with patterns using two coats if necessary. The terracotta absorbs the moisture from the paint, so they will dry very quickly. Step 2. Paint the rim of one pot with a contrasting color. Step 3. Create a zig-zag pattern using masking take and painting alternate sections. Step 4. Fill pots with compost, then position the plants, firming them in place with extra compost. Step 5. The aloe does not need a large pot. Plant it in a pot just slightly larger than the one you bought it in. Step 6. Plant the thyme and pelargonium in separate pots. Finish the plants with a top dressing of gravel, water well and place in a sunny window. For commercial reasons the plants you buy will probably have been grown in a peat compost, although they prefer a loam based compost. Gently loosen the peat around their roots and mix with the loam based compost before potting up in the new mixture. Plant in late spring or early summer. Read more.....Planting a cool plant!